I have written a number of times on the topic of Interply Shear. This is the force that is tring to tear the belts of radial tires apart. There are some highly technical papers on the topic and you can review tham after a simple Google search on the term. You can also look here on my blog for the posts where the term is tied to a post by simply checking the list of topics on the left side of my blog. Basically this force comes about when the belts in a radial tire are forced to change shape. This means either when a tire rolls and the footprint changes from curved to flat as the footprint rolls into contact with the ground. This force increases when external forces from cornering are also applied to tires. So why do trailers seem to have such high Interply Shear forces? Well it's not all trailers as the cornering forces of single axle trailers are much lower than the forces of tandem or triple axle trailers. What tipped me off to this was an observation at a campground that happened to have a freshly smother gravel driveway and a multi-axle trailer happened to make a 180° turn as I was walking by. I noticed that the gravel marks were not a smoth curve but there was a series of turns interupted by discontinuities. While watching their video I recall some special high side load tests we ran in our tire test lab. Here is a short out-take from the longer Keystone video that shows what happens to multi-axle trailer tires. In the video you can see how the two tires are fighting each other with one bending in as the other bends out. You can imagine that if the turn is made on gravel at some point the high sideload would result is a sudden breakaway or slip. That's what I observed on the gravel turn. Back at work I had some high powered Finite Element computer programs run to simulate the side load of a multi axle trailer and the results showed that the side loads on a trailer could be 24% higher than on a standard vehicle even with identical radius and loads on the tires. This post shows why tires get different side loading. Further analysis showed that increasing the tire inflation could lower the extra shear, but sadly not eliminate it. In a number of posts I have recommended that Motorhomes set their inflation based on measured static load plus a margin of at least 10% additional PSI. This would also apply to single axle trailers. BUT for Tandem and triple axle trailers I strongly recommend that the tire cold inflation be set to the inflation molded on the tire sidewall associated with the tire maximum load capacity. I also recommend that the measured static tire loads on these trailers be no greater than 85% of the tire maximum with a 20% margin being better. 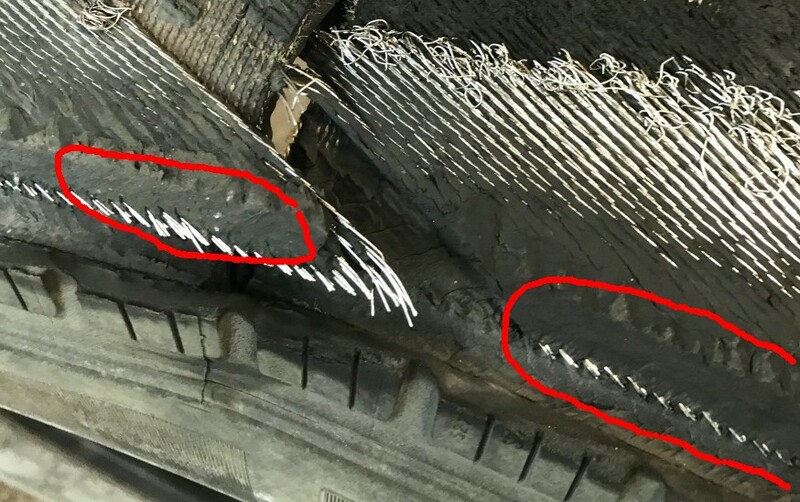 On many of the RV forums I monitor that focus on trailer application, there is a recurring question about changing tires. Some wonder about going up in Load Range (Ply Rating) some wonder about changing the "Type" tire P > ST, or P> LT, or ST > LT. Others want to change the tire dimensions. While there are many reply posts, I do note that not everyone offering answers has worked as a tire design engineer. It takes years of working with the engineering and scientific knowledge before you can be given the responsiblity to develop a new tire capable of passing various company and DOT regulations and be produced for sale in the tens or hundreds of thousands. While I have tried to provide answers, I seem to end up saying the same things over and over so this post is intended to be a go-to post for those asking tire change questions. First, it is important that the owner know the ORIGINAL tire size including the Type and Load Range and the recommended inflation from the RV company along with the GAWR for their specific Trailer. Finally if considering a change we need to ensure that the new tires can properly support the ACTUAL load on the new tires. For P > ST or P > LT you need to remember that application of a P-type tire on trailer required that the RV company "De-rate" the load marked on the tire sidewall Sidewall/1.10 = load capacity of a P-type tire on a trailer. 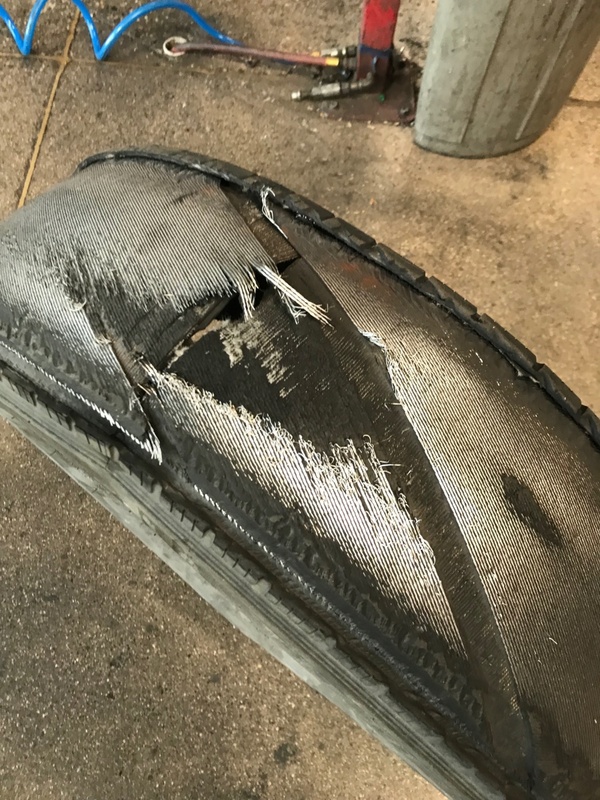 The general rule of thumb "Any replacement tire MUST be capable of supporting equal or greater load than the original tire". 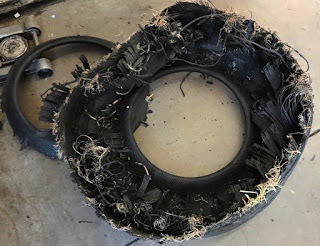 Another rule: You need to ensure that any tire you use is capable of supporting your actual MEASURED load, Not the load your neighbor said he has and not an estimate or the measured load someone posted on a forum. The load measurement ideally should be obtained with your trailer at its heaviest i.e. fuel, water, propane, clothes etc If you can't get individual one side weights DO NOT assume a 50/50% side to side load split. While some trailers may be balanced at 49/51% but some have been found as much as 10% off balance i.e. 40/60% As a rule of thumb I suggest you use at least an assumed 47/53% splits you would use the 53% figure. If making an investment in new size tires & wheels you really need to learn the real loads before making the change or you may discover you bought tires you should not be using. You will need to consult the published Load & Inflation tables for your old and new tire to confirm load capacity numbers. I have THIS post with links to many different tire companies. Be sure you understand how to read the tables as while most provide load capacity per tire, some load figures are per axle. DO NOT use the "Dual" load numbers as these only apply when there are two tires mounted as a pair on each end of an axle. Comment on valves. I always recommend that whenever changing tires, even if you are just replacing with same size and type, that rubber valves be replaced with bolt on metal valves and if you already have metal bolt in valves that you get the various rubber gaskets and "O" rings replaced as these rubber parts age out just as tires age out and it's awful to read about a $2 valve failing which can result in hundreds or thousands of dollars in damage and costs. Late last year RVIA updated the tire type and load spec such that "based on the rating of the axle the tires have to be 10% greater than the axle rating," You will note that RVIA decided to ignore the reality of load unbalance. If you find this post helpful and happen to see someone posting questions about changing tires please consider posting a link to this post as I don't see every tire question posted by all RV owners.